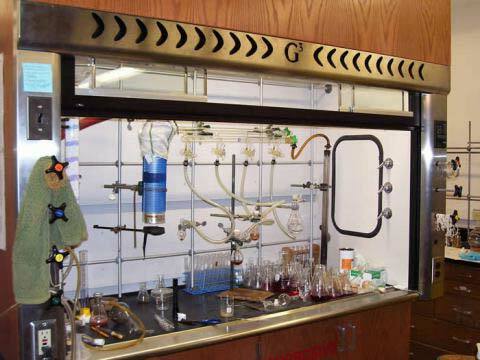 We deal in Schlenk Line Setup is specially designed chemistry apparatus that features various ports. From more than two decades, we are functioning as Schlenk Line Setup Manufacturer, Exporter and Supplier from Pondicherry, India. We have a team of experts to precisely design the Schlenk Line Setup, keeping in mind the danger involved in its use. Schlenk Line Setup can be purchased at reasonable price from us. The Schlenk line (also vacuum gas manifold) is a commonly used chemistry apparatus developed by Wilhelm Schlenk. It consists of a dual manifold with several ports. One manifold is connected to a source of purified inert gas, while the other is connected to a high-vacuum pump. The inert gas line is vented through an oil bubbler, while solvent vapors and gaseous reaction products are prevented from contaminating the vacuum pump through a liquid nitrogen or dry ice/acetone cold trap. Special stopcocks or Teflon taps allow for vacuum or inert gas to be selected without the need for placing the sample on a separate line. Schlenk lines are useful for safely and successfully manipulating air sensitive compounds. The high vacuum is also often used to remove the last traces of solvent from a sample. Vacuum gas manifolds often have many ports and lines, and with care it is possible for several reactions or operations to be run simultaneously.